This six-story brick hotel is 0.5 mile from the shops, restaurants, and historic sites of Annapolis and 1 mile from both the Naval Academy and City Dock on Chesapeake Bay. These central Annapolis inns, located within a half-mile (.8 kilometers) of the US Naval Academy, comprise 3 buildings: the 1727 Governor Calvert House, the 1772 Robert Johnson House, and the 1776 Maryland Inn. 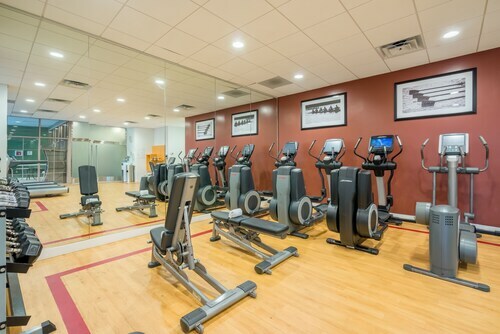 Situated in the business district, this hotel is 0.9 mi (1.4 km) from Prince George's Stadium and within 3 mi (5 km) of Allen Pond Park and National Capital Radio and Television Museum. Belair Stable Museum is 3 mi (4.8 km) away. 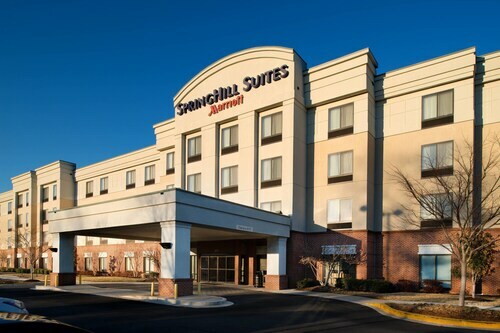 Situated in the business district, this hotel is within 2 mi (3 km) of Westfield Annapolis Mall, Anne Arundel Medical Center, and Broad Creek Marsh. Maryland Hall for Creative Arts and Ballet Theater of Maryland are also within 3 mi (5 km). 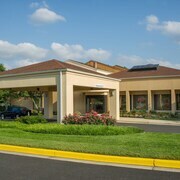 Located in the heart of Annapolis, this motel is within 6 mi (10 km) of U.S. Naval Academy Golf Club, U.S. Naval Academy, and Chesapeake Bay Bridge. Navy-Marine Corps Memorial Stadium and Anne Arundel Medical Center are also within 6 mi (10 km). 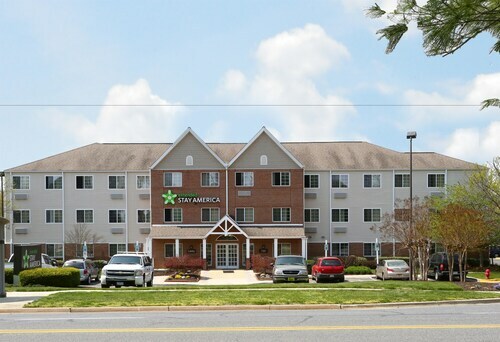 Situated in Annapolis, this hotel is within 2 mi (3 km) of Broad Creek Marsh, Westfield Annapolis Mall, and Anne Arundel Medical Center. Maryland Hall for Creative Arts and Ballet Theater of Maryland are also within 3 mi (5 km). 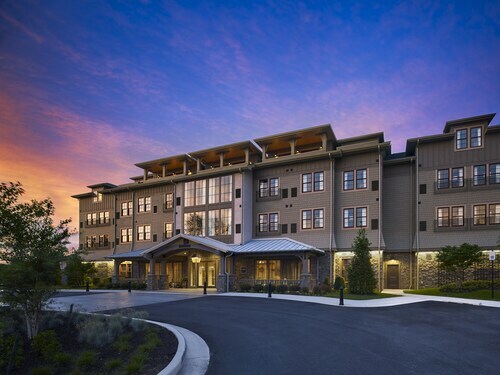 Situated in Annapolis, this hotel is 1.5 mi (2.4 km) from Sandy Point State Park and 1.6 mi (2.5 km) from Chesapeake Bay Bridge. U.S. Naval Academy and U.S. Naval Academy Golf Club are also within 9 mi (15 km). Situated in Annapolis, this motel is within 6 mi (10 km) of U.S. Naval Academy Golf Club, U.S. Naval Academy, and Chesapeake Bay Bridge. Navy-Marine Corps Memorial Stadium and Anne Arundel Medical Center are also within 6 mi (10 km). How Much is a Hotel Room in Annapolis? 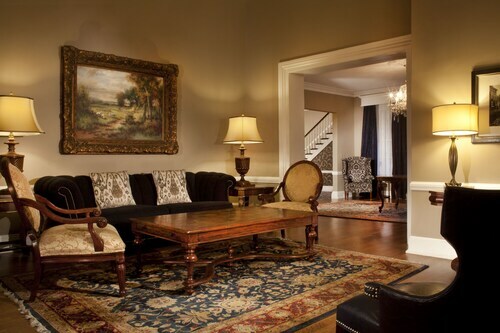 Hotels in Annapolis start at $52 per night. Prices and availability subject to change. Additional terms may apply. Annapolis, Maryland, skillfully integrates the early United States with 21st-century technology to become a popular vacation destination. An Annapolis vacation doesn't only allow you a chance to see the capitol of Maryland, but this thriving small city on the shores of the Chesapeake Bay is also very close to both Baltimore and Washington, D.C.
Any trip to Annapolis has to start with a trip to the Maryland State House, which was built in 1772 and is the current State Capitol. The State House was the first peacetime capitol after the Revolutionary War, and a walk around gives a glimpse into the country's history. You can head over to the United States Naval Academy, which is located by many hotels in Annapolis, MD. Take a walk around campus and go to Michie Stadium in the fall for a football game. Annapolis' naval history can also be seen at Preble Hall, which has pictures depicting both American and European naval history, and by seeing the NSS Annapolis transmitters. Annapolis is the home of the Banneker-Douglass Museum and the Kunte Kinte-Alex Haley Memorial, both of which are powerful displays of African-American history. If you're the outdoorsy type, Quiet Waters Park offers activities from biking, bird watching, and ice skating in the winter. Annapolis is known for its tasty seafood. The best places to find seafood delights, such as crab cakes and oysters with Old Bay seasoning, is along West Street or by the Spa Creek shore south of downtown. The Loretta Heights area is where to go for Mexican food and is near Annapolis hotels. The best nightlife is along the waterfront, whether you are looking to grab a pint in a pub or are looking for cocktails and live music. Search over 400 airlines and more than 510,000 hotels on Travelocity for the best Baltimore flights and the best deals on cheap hotels in Annapolis, MD. Everything was exceptional. Loved that the bathroom was an actual room so I could close the door and have privacy. Shower having separate light was an extra addition. Kitchen was great, just didn't need it. All the storage was helpful. Just one thing would have been better. Blankets could have been a little thicker and longer. It was perfect! 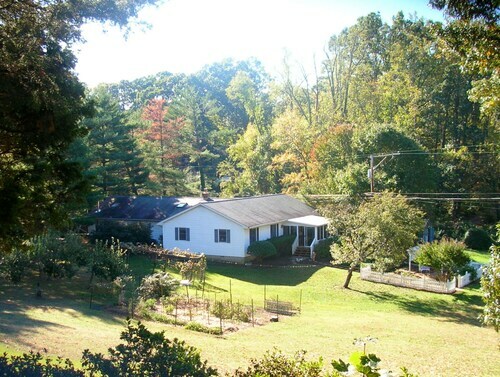 Beautiful garden, clean room, great breakfast, Wendy is really friendly and a great host. Access to stores - pro. Filthy, dirty carpets looked as though they hadn’t been vacuumed in weeks. Dirty light switches. Smelly hallways. 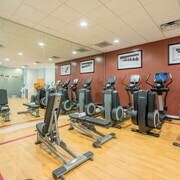 Everything was well maintained and clean without odors. The suite area had comfortable furniture. 2 weeks ago by A verified traveler from Lancaster, Pa. Very nice property. Had a great dinner in restaurant.